Confidence is defined as the ability to be bold, to have faith, to act with assurance. Most who begin the journey into homeschooling cannot be described as confident. Although it may seem surprising, many people who have homeschooled for several years quietly express the same lack of confidence. 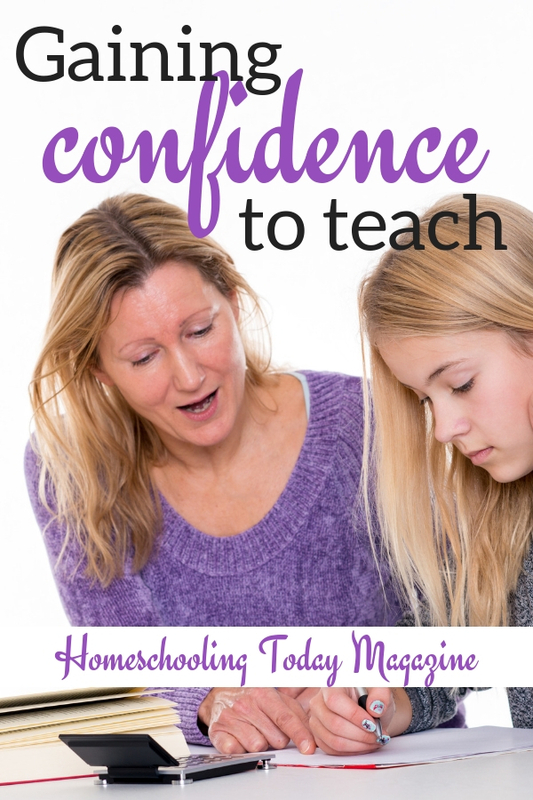 Admitting you lack confidence may be an unpopular thing to do, but making such an admission might provide the first step in gaining the confidence to teach your children at home. A common perception is that confidence comes from ability or knowledge. As a teacher by training and work experience, I have observed that the assumption is often made that persons such as myself move effortlessly from one academic triumph to another. Though some people might think this revelation should be kept under wraps, I have to say that those perceptions are not true. When my children look at me blankly after I have introduced, or even worse, completed activities, I often have the same sense of failure that any first timer might have. Many discoveries might be made during a carefully guided study, but often the lasting lessons and the greatest revelations are unplanned. There is much value in what I’ve read, seen or experienced, but I have to say the more I know, the more I see and appreciate God’s ownership of my children’s homeschooling experience. Lasting confidence in homeschooling comes as a result of recognizing our limitations and seeing God’s grace. Confidence that comes from my own abilities or the results I see in my children is rather fickle – it depends on variables that are beyond my control. My child’s personality, abilities, even physical makeup will determine a great deal of his apparent success or failure. Methods that produce angelic results in friends’ or neighbors’ children may fail miserably with mine. I have encountered many people who feel they are supposed to homeschool, but have truly lost heart because of these kinds of experiences. A woman I know trusted that “calling or sense of what the Lord wanted her to do” and began homeschooling when the odds seemed to be against her. Having several small children, limited finances and a child designated as having several special education problems, she responded in faith by taking her child out of public school. She sought counsel and help with the academic considerations and then put her hand to the plow. She told me of timely encouragement from the Lord and other sustaining graces. The results she described to me at the end of the year were amazing, and the very words she spoke pointed to God’s faithfulness to her and her family. Success in homeschooling is not limited to certain test results, it is the restoration of a discouraged spirit, the acceptance of a limitation, or the realization of a particular gift. Homeschooling successes come in the form of renewed or strengthened love between parent and child or brothers and sisters. It may be as simple as the ability to obey a parental request cheerfully, but one thing is sure – it will never be the same for every homeschooling family. My faith was built by my friend’s simple testimony. I know that God can do similar miracles for us and through us if we will trust Him enough to do what we hear Him saying and let Him be the author of the outcome. Debbie Strayer was the co-founder of Homeschooling Today magazine. She became a part of the homeschooling movement in 1988 when she and husband Greg began their journey as homeschoolers. Prior to that time, Debbie received her Bachelor’s and Master’s Degrees in education. Debbie always felt that her most important accomplishments were that she was the wife of Greg Strayer for 35 years, the mother of homeschool graduates Nate and Ashley and a homeschooling parent for 16 years. I know I’m called to homeschool in the future, and although I’m deeply passionated about it, sometimes I get so scared and feel so incapable! How am I supposed to do such a thing? I suppose that, as with everything, the only solution is to 1) start moving, do it scared, and 2) just trust God! Yes! And know that we are here to help. You CAN do this! You can do it! I’m nearing the end of a journey since 1995 and have about 2-3 years remaining and I’d do it all over again. Keep your ear to the Lord. He’ll direct you. Confidence is usually gained gradually, from day after day of working with children and learning from experience. When a teacher is confident student can sense it and it is the biggest happiness of a teacher.